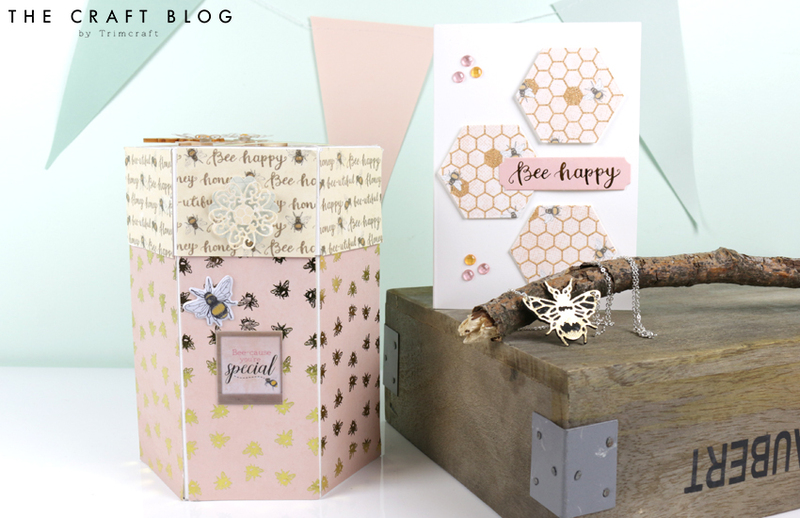 The delicate Bee Happy paper designs are perfect for creating the prettiest gift box so Maxine is going to show you how to create this hexagonal delight with our free printable! 1. Print off your template, cut out, draw around onto pieces of Dovecraft A4 White card and cut the pieces out. 2. Score along each piece as shown, add Dovecraft Perma Fix tape to each tab and begin building your box from the base you created. 3. Adhere the lid pieces together to create the lid. TIP Make sure the lid is slightly bigger than the box so that it fits. 4. Cut pieces of Dovecraft Bee Happy 12x12 paper to fit the sides of the lid, adhere to each side. Cut a piece to fit the top of the lid and adhere. 5. 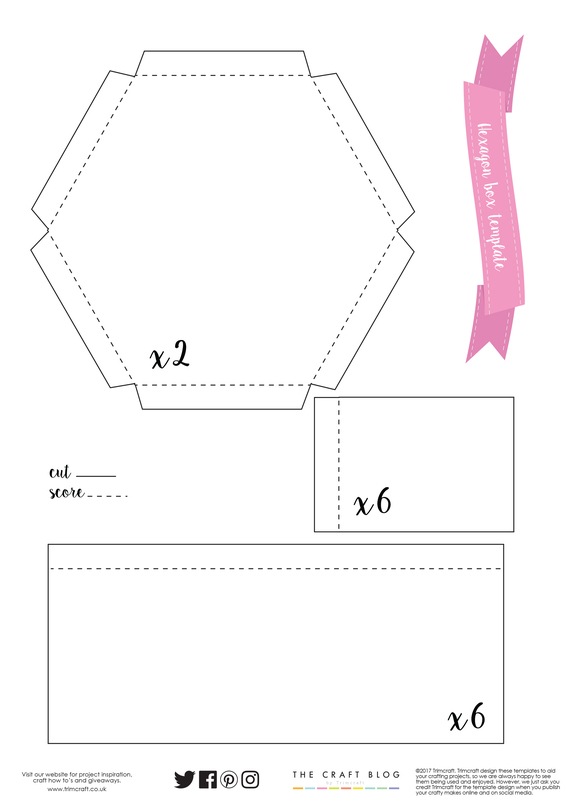 Choose a different Bee Happy paper design and cut pieces to fit the sides of the box. Adhere with Dovecraft Perma Fix. TIP To make a more luxurious box add papers to the inside too. 6. Die cut the Dovecraft layering flowers dies onto your chosen Bee Happy papers and adhere to the box to decorate. Add your chosen stickers, sentiment and wooden shape to the box to finish. This box would be wonderful for filling with beauty products and it’s tall enough to fit a variety of other gifts! If you’re a lover of all things to do with bees, you could also die cut the Dovecraft Bee Happy bee die onto the gold pearlescent paper found within the paper pad. Layer onto a piece of Dovecraft black card, cut the excess off around the bee and thread onto your chosen chain! This trendy accessory is so pretty and will add wonderful detail to your outfit. The Bee Happy collection is serious eye candy, making it so easy for you to create a sweet and simple card to use for a variety of occasions. Simply layer your favourite papers, add a few embellishments and you will have created a delightful design in no time! How will you use the Dovecraft Bee Happy Collection? We’d love to see so don’t forget to #trimcraft when uploading to social media and to share your projects in the Inspiration area! If you would love to WIN your very own Bee Happy bundle, you have to check out our Monthly Competition!